Newly-appointed Finance Minister Dr Khatiwada pledges fiscal stability - Integration Through Media ....! Kathmandu, Feb 26 – Newly-elected Finance Minister Dr Yubraj Khatiwada has said that the economic issues mentioned in the fundamental rights and directive principles of the state in the Constitution of Nepal would be implemented. Assuming the office today, Dr Khatiwada said, “Economic sector shall move ahead based on constitution’s norms and spirit”. Stating that implementing the promises made to the people from the left alliance was his responsibility, the Finance Minister added that he would advance the commitments made in the international forums at once. Dr Khatiwada said that cooperation would be forged with the private, cooperative and community sectors based on reciprocity to give the leadership for the socialism-oriented welfare state envisioned by the constitution. Stressing for an end to indiscipline in government financial management that create economic prosperity and poverty alleviation, Dr Khatiwada committed to maintaining discipline in government fiscal system and effectiveness in the expenditure. The Finance Minister argued that the means and resources of the state should be focused on productive sector for stability in the fiscal system. As the private sector was the engine of the high economic growth, he shared the development projects and infrastructures would be advanced by mobilizing internal and external resources. The economist turned finance minister further said that the international assistance was needed for trade investment and technology handover. 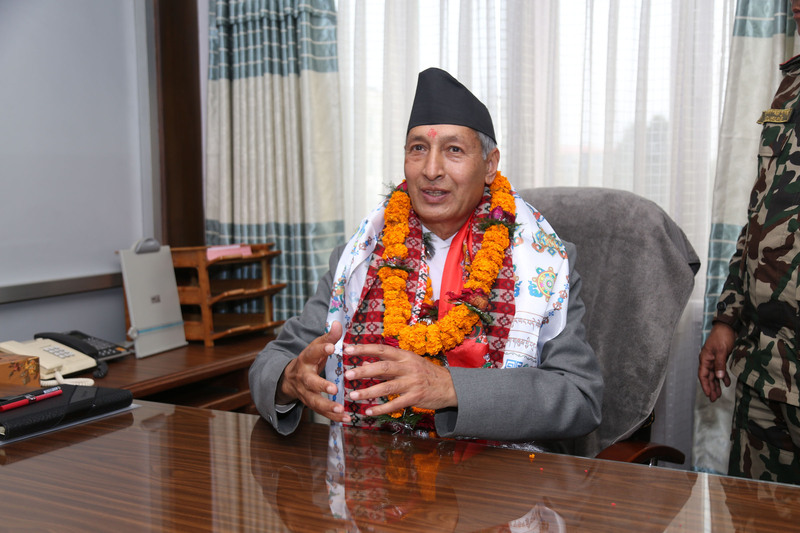 Dr Khatiwada has already performed his role as the Vice-Chairman of the National Planning Commission and Governor of the Nepal Rastra Bank (NRB). On the occasion, Finance Secretary Shankar Prasad Adhikari welcomed the newly appointed finance minister and expressed confidence to the country’s economy moving towards stability.